The violence in Georgia may have subsided, but the consequences of the past few days will play out in South Ossetia and Abkhazia for many years, writes Caucasus expert Magdalena Frichova. Will the different ethnic groups be able to cohabit peacefully again? Relations between Russia and Georgia have reached a poisonous new low. But it is relations within the conflict regions that will suffer most. All ethnic groups have suffered at the hands of the main protagonists - with widespread reports of war crimes - and it is difficult to see how the ethnic Ossetians and Abkhaz will cohabit peacefully once again with ethnic Georgians. The two ethnic conflicts had been largely dormant and their peace processes frozen. But since the 2003 Rose Revolution, Tbilisi's pro-peace rhetoric was accompanied by an assertive and sometimes militant push to restore Georgia's territorial integrity and counter Russia's meddling in the region. Security in the zones of conflict had deteriorated and confidence between the divided communities plummeted. 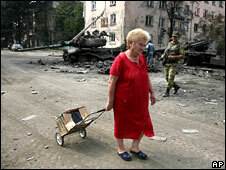 South Ossetia has been ripped apart in the latest fighting. In this region of 75,000 people, ethnic Georgian and ethnic Ossetian villages exist side by side in a chequerboard-like pattern. After an earlier Georgian military adventure in 2004, and with the peace process stalled, the communities grew so deeply apart that they now have separate gas and electricity networks. A web of bypass roads exists to help them avoid each other. The United Nations refugee agency UNHCR estimates that almost 100,000 people have been displaced from South Ossetia and areas around it in the last few days. Moscow says some 25,000 South Ossetians have found refuge in Russia, in North Ossetia. The number of civilian casualties has yet to be independently established. Moscow claims 2,000 people were killed. US-based Human Rights Watch has said this cannot be independently verified. Sources on the ground also make as yet unverifiable claims about atrocities and other crimes. Larisa, an Ossetian refugee in North Ossetia, told me that her neighbour, now also in Vladikavkaz, "witnessed burning of people in a village church" before reaching safety. A Georgian source talked of abductions by Ossetians of Georgian males who stayed behind in the conflict zone's villages. Russia and Georgia are also trading accusations of mass atrocities. But leaving the song and dance of politically motivated justifications aside, ethnic hatreds are once again out in the open, and war traumas from the early 1990s have resurfaced between Georgians and Ossetians. Credible and impartial investigations of violations and, if appropriate, the prosecution of perpetrators, could advance long-term reconciliation and would help build confidence that Western responses will be even handed. This is important, as there may well be a need for a bigger EU role in peacekeeping and conflict resolution. If the new ceasefire holds, security guarantees will be necessary to enable civilians to return. The pre-conflict peacekeeping force - composed of a battalion from each of Georgia, Russia and South Ossetia - is not adequate to deliver long-term security to the region. In Abkhazia, where fighting was largely limited to the Kodori Gorge, the main risk now is of a new wave of people being uprooted from their homes. 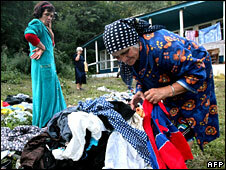 More than 200,000 ethnic Georgians fled Abkhazia during the 1992-1993 war. Since then, some have returned to Gali, a historically Georgian-inhabited district adjacent to the ceasefire line. The approximately 60,000 returnees have splintered loyalties. Ethnically Georgian, they fall under the de facto Abkhaz administration and they have been subject to human rights abuses by both sides. The Abkhaz question their political loyalties, the Georgians consider them traitors. There have been no reports as yet of a mass exodus. The Russian troops advancing into Georgia proper passed through the area but there was no widespread fighting. 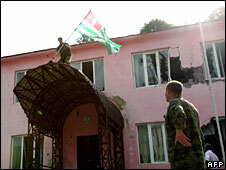 However, in the poisonous environment generated by the conflict, the Georgians who stayed behind in Abkhazia may now be treated even more harshly - by both sides. Without decisive international pressure to protect them, they could be displaced. Here, too, the existing peacekeeping mission - a Russian-dominated Commonwealth of Independent States (CIS) force observed by the UN - will not now be trusted by all sides, and an international peacekeeping contingent may be needed. Tbilisi's reckless miscalculation in South Ossetia, and Russia's subsequent aggressive and disproportionate response, have deepened the divide between Georgia and its breakaway regions. Over the past decade, Tbilisi's strategy of isolation and pressure against the regions had failed to make Georgia attractive to the Abkhaz and Ossetians. The Georgian operation in South Ossetia may have alienated them irreversibly. While they had long understood that Russia was more interested in their territory than people, the recent conflict has turned their regions into de facto Russian protectorates. This is also bad news for Abkhaz and South Ossetians, most of whom welcome Russia's security umbrella, but do not want to take orders from Moscow. Magdalena Frichova has worked on conflict issues in the South Caucasus since 1999, most recently as Project Director for International Crisis Group.